Summer mood: What flowers to give in the summer? Summer - without underestimating the brightest and most joyous time of the year. Indeed, it is in the summer that many have such a long-awaited vacation, the sea, the sun, palms, favorite beaches and such warm night walks. But summer is not only the brightest season, but the hottest season. How to choose the right flowers? Which bouquets to give their preference? Choosing bouquets in flower shops, consider what is in the room, where they are always cool and low air temperature. This is done in order to preserve the freshness of flowers as long as possible, but having bought flowers and going out, one can feel a tangible temperature drop. Cool flower room and incredible heat on the street! And we do not forget about the fact that flowers are sensitive enough to sudden temperature changes and such a rapid change of their "habitat" can lead to rapid withering. When buying flowers, try to pick up the freshest ones, because as long as you deliver them to their destination, they will lose their freshness and presentable appearance a little. But what to do to keep the flowers beautiful and original? The best variant of the summer bouquet is gerbera. 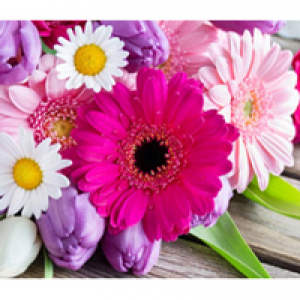 Give colorful gerberas of different colors and a bright holiday is provided! The greatest advantage of these colors is their stamina. If you do not forget to look after them, gerberas will stay for about a month. There is another flower that boldly tolerates the summer heat - chrysanthemum. Chrysanthemums, as well as gerberas, are somewhat like chamomile. But unlike chamomiles, chrysanthemums and gerberas have a wide choice of color palette and it is possible to make the most various colorful bouquets. In summer it is recommended to choose light bouquets. Light and airy can become a bouquet of eust, which is also considered persistent and with careful care can delight you for several weeks. If you want to choose not from a certain list of persistent colors, but to pick up something that is according to your taste and what your soul is, you can use the delivery of flowers. In the summer couple, as never before, it is important to maintain freshness and presentable colors that can disappear even for a couple of hours in the heat. The advantages of flower delivery services are availability and delivery of exceptionally fresh and beautiful flowers. The fact is that when buying flowers in a store, you can not be sure that these flowers are really fresh, and do not stand in the store for a week fueled with special substances (which, as has already been proved, are not always harmless). Ordering the same flowers with the help of delivery service, in quality and freshness of bouquets can be sure. After all, for each order, flowers are selected individually, that is, the freshness of such flowers is guaranteed. After buying in a floristic store, even the most spectacular bouquet after a couple of hours of improper transportation to the destination loses all its splendor and elegance. But ordering flowers with the help of delivery services can be confident in the beauty and presentability of the bouquet. After all, these services use a special transport, which allows you to keep the beautiful appearance of the flower arrangement. And when ordering flowers with the help of the flower delivery service BuketLand, the beauty and quality of your bouquet is guaranteed.